On the current political changes in South America and Central America. The down trodden have much more awareness of the difference between themselves and the fat wolves who run their economic-political system. Maintained by California Skeptics – 3-23-2012. Every site by California Skeptics has high quality artwork on its homepage and featured articles. There is a site on just the featured artists, with links. There is an evil afoot, neoliberalism. It is neither new nor liberal, but the organized effort of multinational corporations and international banks to increase their profits. In the developed nations they have been the principle contributors to the politicians and parties that support their flat-world policies. And in the third world through the WTO and IMF (their tools) they have set out a broad agenda and won support through loans of which a portion is siphoned off. These loans come with clauses that require adopting flat-world policies: Policies that require opening the resources, the media, the utilities, and banking, the borders, and the very market place to being taken over by international banking and corporations. These polices are promulgated through trade treaties with titles such as NAFTA, CAFTA, and MAFTA. There are clauses in these trade treaties which permit the overriding of local environmental, commerce, and tariff laws. National sovereignty is sold for political donations made by big business. These policies have resulted in the out sourcing of jobs, the flood of tariff-free goods, the flood of undocumented workers, the reduction in the pay for skilled labor, the breaking of unions, the reduction of social services, the reduction of corporate taxes and the tax on the top 1%, and the financial burden and instability associated with a national debt that is 7% of our GDP. There is an evil afoot, neoliberalism. In the past 30 years productivity has gone up over 40%, yet real wages (including benefits) have gone down. Family income has remained level because now two earn the income of one. In 1950s, there were very few working mothers. History is repeating itself: the flat worlders, driven by profits, are taking us to 1929. Greed is greed, and what benefits one group comes at an expense to society. Our corporate media has sold the public on the virtues of Neoliberalism. California Skeptics are publishing articles which show why you shouldn’t be sold on their policies. The results speak of its failures. Populace movements in South America have in a few nations elected governments which reject these policies. 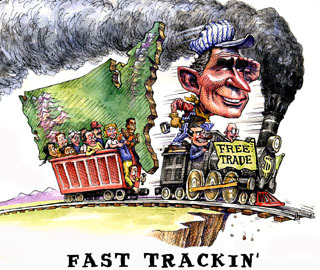 Articles on the WTO and there opposition have been published by us.